SSC applicants, check out the most important job notification that is RBI Security Guard Recruitment 2018. Only SSC qualified ones are eligible to these RBI 270 Security Guard Vacancy. Get into this page to register the RBI Security Guard Application Form in www.rbi.org.in. 9th Nov to 30th Nov 2018 applications is received by RBI. 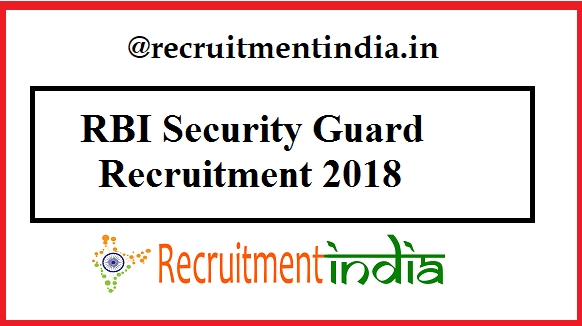 UG and PG completed ones are not eligible for this RBI Security Guard Recruitment 2018. This point is mainly highlighted in the RBI 270 Security Guard Job notice. So degree qualified candidates don’t apply as RBI will not consider your application form. Reserve Bank of India has given the golden career opportunity for the undergraduate candidates. Here undergraduate means who are not having the degree qualification. So all the SSC/ inter qualified candidates just look at the RBI Security Guard Vacancy 2018 of a huge number of vacancy. Totaly 270 Security Guard postings bell ve done by the RBI by the end of this recruitment process. And it clearly states that the candidates who are possessing the Graduate or PG qualification, for them this RBI Security Guard Recruitment 2018 is not eligible one. Only the candidates who have the higher qualification as SSC or inter, have to fill the RBI Security Guard Application Form from 9th Nov to 30th Nov 2018. Along with the SSC candidates for the Ex-service man, this RBI Security Guard Recruitment is open. Special reservation is given for the Exservice man and the RBI staff. Further details of this 270 Security Guard Notification in RBI are elaborated in the simple words. Recruitmentindia.in well managed the information in a systematic manner. In the order of eligibility priority, the qualifications are listed in the below section of the page. Main criteria for the RBI Security Guard job Notification is the educational qualification. That one is discussed in the starting only. Next, to it, the age limit is the strict criteria. Unreserved candidates maximum age limit is 25 years. For reserved candidates, 5 years of relaxation is given. RBI Security Guard Salary is Rs.10940/- per month in the scale of 10940-380 (4)-12460- 440(3) -13780-520(3)-15340-690 (2)-16720- 860(4) – 20160-1180 (3)- 23700 (20 years) and other allowances. Kindly know the RBI Security Guard payscale who are interested in applying of this. To fill the RBI Security Guard Application Form 2018, candidates can check the application fees details in the notification. By counting the total number of Security Guard Vacancy positions present in all the RBIs of India, the figure comes out is the 270 posts. Then for the employment of completely deserved candidates, the RBI Security Guard 2018 Notification is released. Candidates got the invitation of applying for the RBI Security Guard Online form from this notification. RBI offers an excellent salary package to the finally posted candidates. RBI Security Guard salary per month is Rs.10940/- along with the plenty of allowances. Detailed salary info is presented in the eligibility criteria section. On its own RBI gives the pay scale range in the RBI 270 Security Guard Jobs Notification. Ex-service man who is seeking the RBI vacancy 2018-19, should try this recruitment. At the time of notification release, the link of RBI Security Guard Online form is liberated. Till the closing date of 30th Niv 2018, the application link and payment link remains in the opening state. From 9th Nov to 30th Nov 2018, applicants in any time can finish off the steps of registration including the payment. Accepting of www.rbi.org.in Security Guard Application is done only if the application fees payment is done by the eligible one. Those who are already working in the RBI, they do not have to pay any amount. By entering the RBI employ id in the application, you can get the fees exemption. Most importantly candidates have to check the RBI Security Guard Physical Tests. Are you efficient to do all those physical tests, then fill the RBI Security Guard Recruitment form. Qualifying in these PET tests is mandatory. Written exam RBI Security Guard Syllabus is provided now.